During my recent visit to the beautiful community of Lwala, Kenya, a family invited us to visit their home. It was nestled in the middle of rows of corn, the crop they sold at the market. They were proud to show us around the yard, sharing the stories of how their family had worked hard at improving their crop yield after receiving agriculture education through Lwala Community Alliance, Blood:Water’s local partner. After meeting the family and exchanging some small conversation, they invited us to take a walk with them—a walk to where they collected water for their family. On the way down the hill along the narrow trail, we were chatting, laughing, talking about the beauty of the hillside. I was distracted by my surroundings, not quite realizing what I was about to do. I had an empty jerry can in my hands, but somehow it didn't register that it was, well, empty. I was walking for water, and I didn't even know it. The walk ended abruptly when we made it to the bottom of the hill. One of the frequent Africa rains had recently passed over the mountains nearby onto the village, and I tried to keep my footing in the slippery new mud. The women circled the watering hole just as they do on a daily basis, lining up their buckets and jerry cans to collect the needed water for their families. But the water source wasn't a well, rain tank or a protected spring. It was a hand dug well. No protection from the environment or animals or people. And in a community where latrines are few, what happens uphill flows downhill. I suddenly realized the magnitude of what I was doing. It wasn't just an exercise. It wasn't just an experience. I wasn't just going for a walk. I was experiencing the daily life of the people in Lwala. They lined up the buckets and took mine from my hands. The women tilted the jerry cans to skim the water from the top, hoping the sediment, and anything else, would sink to the bottom. Regardless of their efforts, the disease in the water doesn't sink to the bottom. Contamination doesn't follow directions. Within moments, the jerry can was handed back to me. It was definitely not empty anymore. How far did we walk? I started to wonder. As I turned around to walk back, I suddenly remembered that we had walked downhill to get here. Now we have to walk uphill. With a jerry can. A full jerry can. The nearly 50 pounds of water we each carried seemed to silence the walk back. We were all focused on the step in front of us. It really wasn't much further, was it? I could hear the breaths of those around me as well as my own. The silence covered me in the reality of what I was doing. It wasn't just a walk. It wasn’t just a demonstration. It was a way of life. Then it hit me. I was bringing water—contaminated water—back to this family's home. That isn't a gift. That really isn't helpful. How is this walk helpful? I would rather pour it out. But I can't. The family needs it. The very thing that is sustaining their lives is also crippling it. Thanks to the work of Blood:Water and their partners in this region, the walk is changing. 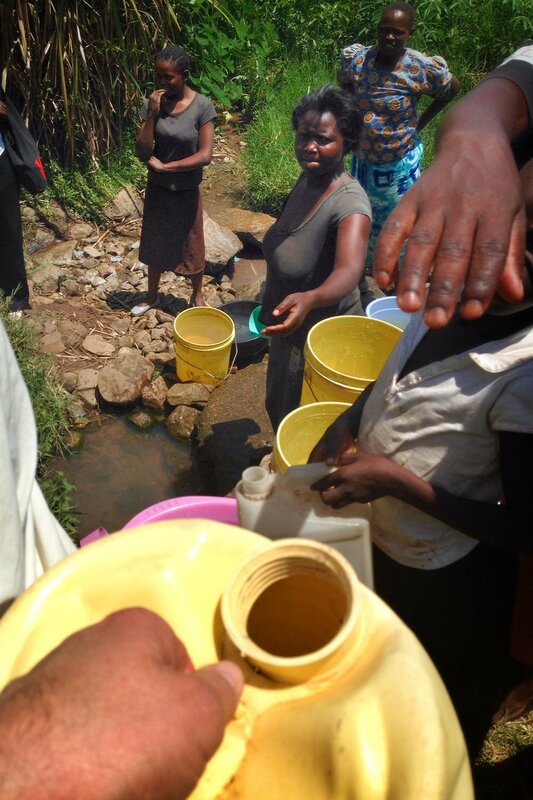 Communities are getting access to water through rain tanks and wells. Families are educated on where disease is coming from and how behaviors need to change to improve health. Individuals are sharing their education with their neighbors and friends. Home by home. Community by community. Until then, this family still walks. This Tuesday, WFSH 104.7 and Faith Talk 970 in Atlanta want to invite you to change the story for 2,000 families like this one. If you are in the area, listen to our Co-Founders Jena Lee Nardella and Jars of Clay share stories of those who are waiting for this journey to change. You can change a family’s walk for as little as $130—providing water, a hand washing station and health education. Will you change the walk?